Recently I’ve been programming some games using Pygame Zero. 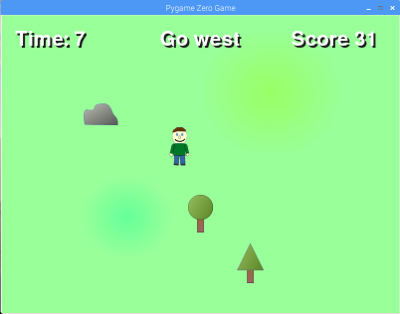 Pygame Zero is combination of libraries and other code that interfaces with Pygame to make it easier to program graphical games (or other applications). I’ve created two games so far one of which is designed for the Picade, Raspberry Pi based mini Arcade Machine and the other second is mouse based. This is the compass game. Use the joystick (or cursor keys) to move the character around the field. 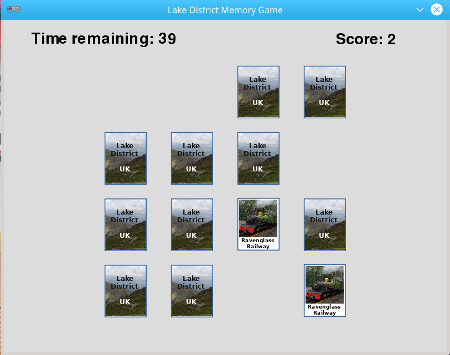 This is the a memory card game. It’s mouse driven. The supplied cards are based on photos from the Lake District in the UK. This entry was posted on Monday, October 15th, 2018 and is filed under Linux, Programming, RaspberryPi, Scouts. You can follow any responses to this entry through the RSS 2.0 feed. Both comments and pings are currently closed.